Good grief! We could conceivably have over 20 boats! Herewith the bits and pieces you need to be ready for our Guildford weekend. 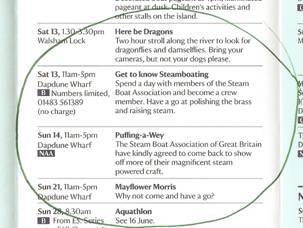 We have bookings from the named people above but some of the boat names may not be right. Other SBA members will be present too. Some boats may only make it (a) if they’ve been completed yet (b) had engines satisfactorily installed (c) sorted their boilers out (small things like that). Much of the following has already been sent to you but more has been added. If you’re looking for accommodation (B&Bs) we may have a problem and Google will need to be brought into action. · Boats attending will not need to buy a w/e Wey Navigation licence! · All attending boats must bring, as usual, evidence of current insurance and Boat Safety Certification which owners may be called upon to produce. · The concrete slip is superb. Nicely graded, it is used to launch and recover the NT's own 36' electric Frolic trip launch. · However... there are a lot of boats coming , and if you are a regular Wey boater, it would be most helpful if you could launch at Stoke Lock and leave your trailer there to leave room for possible campers and general moving around at Dapdune. We have found to our horror that ‘Guilfest’ channged its previously advertised date and is happening on our weeken: furthermore this year is not allowing camping – so B&Bs are hard to find for us. Please Google up B&Bs and don’t be afraid to come as far west as, say Pirbright/ Ash/ Mychett/ Farnborough or North to Woking or Brookwood. It doesn’t take long to get into Guilford. Minimal: We are grateful for the provision of licences to use the waterway for those who are visiting (for some steamboats this is home waters). We will need a contribution for the cost of the Saturday night BBQ but this will not be heavy. A media release has gone out and a taster cruise for journos offered by Mark Rudall. IT IS IMPORTANT TO NOTE that SBA members intending to be at Dapdune are absolutely free to opt out of the interactive/training element of the Saturday. The fact that they are there with their boats provides colour and atmosphere of its own and their time is also their own! It also may be important to opt out if they have not been a boat owner long and need to be focused on management of their own vessel, family etc. Phone enquries re the day to the Dapdune office: If asked, the Dapdune office responses to questions should be that visitors for the morning session should arrive in time for an 11.00am start, and for the afternoon session at 2.00pm. Note: There are only limited lifejackets for very small children, so if potential visitors own them already it would be useful if they brought them along. Visitors to start arriving at 11.00. On the Saturday it would be optimum if some boats were not in the water until visitors arrive so the process of preparation and launch can be watched closely alongside the other attractions below. light up as if it were in a boat. There may be other ideas from NT personnel and SBA members: What can you offer? At the end of the day the SBA boats to take NT staff and other helpers for a short evening cruise to St Caherine's lock and back to be followed by a relaxed meal at Dapdune. There will be a modest charge for the catering. If you need coal or oil we I strongly advise, because of the compactness of the site, that you bring what you’ll need. One visitor from the North has asked for five bags of coal and I have had that delivered (just to put her mind at rest) ! To find Dapdune Wharf : check the National Trust website pages for Dapdune. The entrance is close to the centre of Guildford and as you come in along the A228 Horsham road look for the sign immediately at the far end of the County Cricket Ground on your right. You may be wise to go to the next roundabout and come back to make a light left turn into the rather restricted approach to Dapdune. Boats up to 25’ can get in without hassle but if in doubt and you’d prefer an alternative launch point talk to Mark R, who will arrange for you to be met at Stoke Lock in North Guildford, off Slyfield Road. Lovely slip there too. Can you return this slightly forbidding form to me please as soon as you can! If you wish to be part of the Saturday evening meal (there’s no obligation) it’s rather important this is back by the beginning of July to help with provisioning. Many thanks.